Do you want to search routes from a map? If you are one of those who prefer to visually discover the routes depending on where they are located, Wikiloc makes a World Map for Searching Routes available to you. On the left: a list of the search results. Higher levels of zoom will show the routes with the highest TrailRanks. And as you zoom, the rest of the routes will appear. To see them all make sure that you have the filters you want (or none) marked in the list on the left. It might happen, you already have some types of activities filtered while opening the map since these are determined by the types of favorite activities marked on your profile. 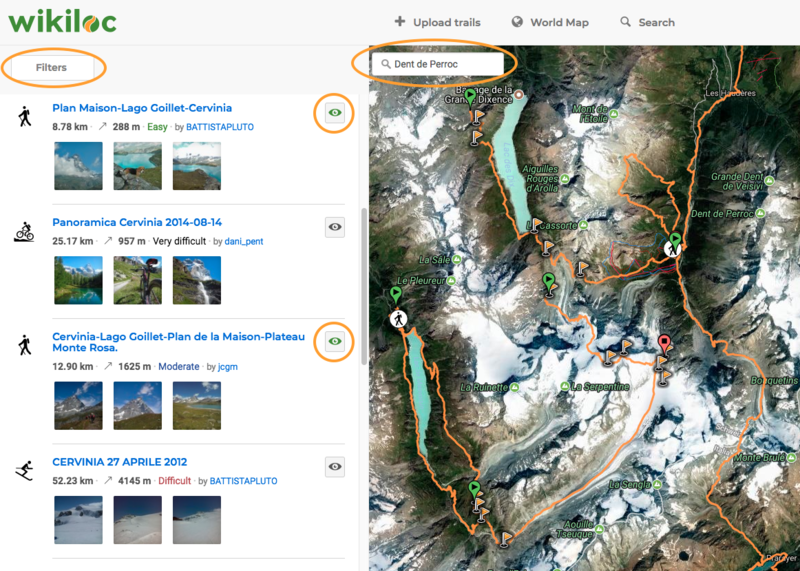 Do you want to see the track of the routes you are interested embodied in a map? You can do it through the eye-shaped icons that you will find on each title's right margin. If you click on it, the route will appear traced on the map. You can select several routes so that the map can be viewed at the same time. This tool is only available on the Website. We hope to offer this option very soon within the mobile App.